The hammers on your piano have reached the point where routine maintenance in the form of filing off the outer wear layer would be of benefit. The result would be heard in a crisper, cleaner tone more like what the piano sounded like when it was in the showroom as a new instrument. Wear and tear on a set of hammers is measured by the depth of the cut marks in the striking surfaces (impact point) of the hammers. 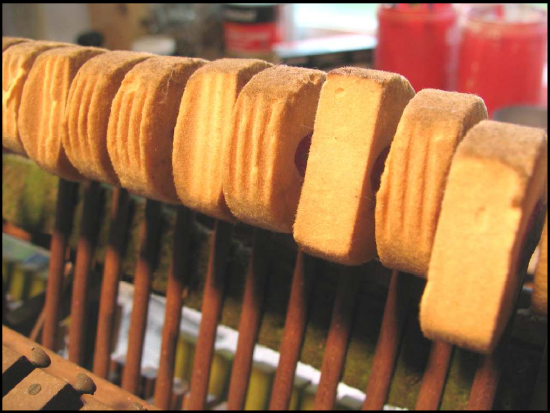 In a piano, hammers wear in a direction opposite to the wear on a set of tires for your car. The more miles on your tires, the shallower the grooves of the tread. With hammers, the more wear that has occurred, the deeper the grooves. The deeper these grooves, or cut marks, the more impact on the piano’s tone. In your piano the cut marks on the hammers have reached a depth where I believe it is impacting the tone of your instrument in a negative way. What exactly are hammers are and why are they so important? Hammers in a piano are somewhat like the mallets used to play a xylophone, except that in a piano each of the 88 notes of the instrument has its own separate mallet, or hammer. In the above photo, you see a line of hammers in a piano action (working mechanism). When a key is played, the chosen hammer swings on a pivot point and strikes the strings, resulting in a tone. Hammers, strings and soundboard are the three vital factors in the quality of this tone. Of the three important components of tone production, hammers over time often become the weakest link, so to speak. 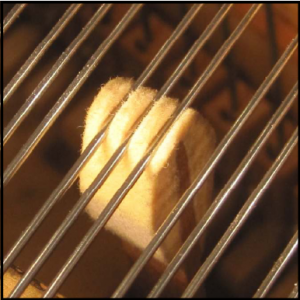 The hammers of the acoustic piano receive more punishment than any other part inside the action of the piano. Very literally they take a pounding on a day-in, day-out basis. As such, over time, they begin to wear out. It is a slow but steady process. The good news is that frequently a set of hammers, even on an older piano, can be given a new lease on life with a careful filing, or shaping. While in cases of severe wear and tear, hammers sometimes must be duplicated and replaced (a more costly procedure), the hammers on your piano, I believe, can be improved and returned to service for quite some time. Could you describe the process of wear on hammers more precisely? metal strings begin to bite into the stiff felt of the hammer. As more and more fibers in the hammer are broken over time, the cuts become deeper. Eventually, the once-smooth hammer takes on the appearance of the hammer on the right. Why do these cut marks have a negative impact on tone? 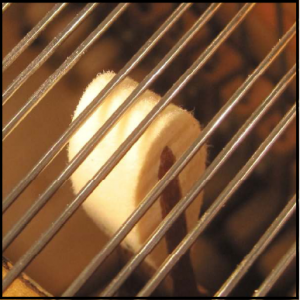 Since the broken fibers have no tension, the hammer over time becomes encased in a dead layer of felt, which does not have the resiliency, or bounce, of its original surface. What’s more, if the cuts are allowed to deepen, the hammer does not impart a clean blow to the strings, but instead wraps around the strings, producing a tone that is inferior in comparison with how the piano sounded when new. Skillful shaping of hammers done by a professional can produce very positive results, if enough of the original felt remains to work with. When a hammer with deep cuts from years of hard playing strikes the strings it has a mushy feel. The felt of the hammer, instead of delivering a clean blow to the strings, wraps around the strings upon point of impact producing an unsatisfactory tone. Compare the tone made by a hammer in this condition to that which would be produced by an accomplished violinist trying to play her instrument while wearing a wooly mitten on her left hand. No matter her level of skill, the results would be poor. The good news is that this outer wear layer is covering good felt underneath. If enough of the original felt remains, a skillful reshaping in combination with careful voicing can return much of what has been lost in the tonal quality of the piano. A hammer that has been carefully filed strikes the strings with a clean blow, delivering maximum power to the strings without producing the weird overtones created by a worn hammer as the felt ‘fingers’ wrap around the strings. professional piano technician. By hiring a qualified technician to do this work, you are making a wise decision in keeping your piano performing up to its potential. Can every set of hammers be reconditioned by filing? Unfortunately, no. The above set of hammers, for example, had suffered extreme wear which would have made resurfacing impossible. Worse, someone had simply sawed off the fronts of several of the hammers in a botched attempt at repair. Although it is at times a judgment call whether there is enough felt left to work with, there are times in which there is no use in trying to do anything with a set of hammers that has long out-lasted its usefulness. The hammers on your instrument, fortunately, are not in such sorry shape and may be successfully filed, a more economical repair than total replacement. The photos below of the same hammer before and after being shaped illustrate just how effective a proper job of filing can be. Where would the repair be carried out? The work could be done either in your home or in my shop, whichever suits you the best. While it is necessary to remove the action from the piano, it is at times possible to work on the hammers in a client’s home, as shown in the photo above. A simple platform such as a card table or bench is all the space that’s generally needed. On the other hand, if you wish to avoid the issue of dust (which is a necessary by-product of the procedure), or if the action has other time-consuming repairs which need to be performed as well, transporting the action to my shop space may be what’s best. In the shop, the action can be placed on a proper bench and worked on with all the necessary equipment close at hand. While there are a few simple maintenance chores that every piano owner should know how to perform (such as knowing how to adjust the sustain pedal), filing hammers would definitely not be on the list of projects for a do-it-yourselfer to try. A badly done filing of a set of hammers would do far more harm than good to the tonal qualities of a piano. Gauging exactly how much felt to remove to achieve the best results takes a skillful hand and eye that come with experience. Hammers are shaped by hand sanding with either a sandpaper file or a sandpaper strip, both of which are shown above. The sanding technique involved require a great deal of practice to perfect and should only be performed by a professional. In addition to filing, voicing the hammers (improving and evening out the tone) will be needed to complete the job. This involves using special tools to adjust the hardness of the hammers. When I’m reconditioning piano hammers, I probably spend as much time voicing as I do filing.